Take a moment to answer the following questions. What do you spend the most time doing? What activity takes up the majority of your day, your week, your month (or even your year — in case you started to sing the “Friends” theme song to yourself)? Despite what you may have seen on TV sitcoms, for most of us it’s not hanging out with friends in a coffee shop — it’s working! Now consider this: If you work a 40-hour week with four weeks of vacation per year, over the course of 40 years you will have worked a total of 76,800 hours. That equates to approximately 33% of your waking hours over that 40 years. Keep in mind, these numbers are conservative because not everyone works just 40 hours a week or gets four weeks of annual vacation or retires after 40 years. 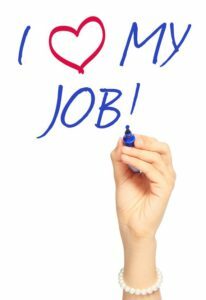 Since work is an activity that takes up 33% of waking life, a worthwhile question to ask yourself is: Am I happy with my job? Some people may have a quick answer, others may have a more hesitant response. Regardless, it is important to assess and reflect on where you are in your career by asking yourself questions such as: What do I want to get out of my job? Am I reaching my career goals? Am I satisfied? That last question is a major one. And it’s important to remember that there are many things that can contribute to job satisfaction. For instance, you may feel satisfied with your benefits or your colleagues, but not feel satisfied with your job tasks. Someone else may feel satisfied and happy with their job tasks, benefits, and colleagues but may not feel satisfied with the organizational culture. One theory on this topic suggests that satisfaction stems from a match between one’s personality traits and the job environment. The theory, posited by John Holland, holds that people and job environments can be represented through six categories and when there is a match between the individual and the job category, people are more likely to be satisfied in their jobs. In other words, we tend to be more satisfied in our job when the tasks of that job fit with our preferences — not when we try to make ourselves fit with a job. Maybe after taking this honest inventory, you realize there are one or two things at your job that you don’t enjoy. If that is the case for you, it may be helpful to consider ways to adjust these areas. For instance, maybe your current position doesn’t offer the opportunity for you to do as much social engagement and outreach as you would like. This is something that may be resolved by approaching your boss to suggest outreach activities in the community and/or an increased social media presence. In some situations, advocating for ourselves within our current position can be quite effective in increasing job satisfaction. It can be scary to think about leaving your job. However, if there are many pieces of your current position that leave you feeling unsatisfied in your work, it may be time to consider whether another organization/position/career path may offer a better fit for you. As Holland’s theory would suggest, you need to find a position that fits your preferences. It may also be helpful to remember that the world of work is not the same as it was 10 or 20 years ago. People are frequently changing positions and jobs. Many people “reinvent” their career at some point during their life. It is possible that, after this self-reflection, you realize that there are multiple tasks that you enjoy. There may not be a way for all of these to be represented in one position. This is very common! If this is the case for you, consider volunteer or part-time options that could contribute to a sense of fulfillment in your work. For example, if you are someone who enjoys spending time caring for animals, but that is not a part of the traditional 9 to 5 job that you also enjoy, consider a volunteer position at the local animal shelter to fulfill that interest. Alternatively, you may decide that two positions offering different experiences that you are interested in would be the best way to facilitate career and job satisfaction. In this case you might pursue part-time work in two positions. There are many ways to adjust or add to your current role to increase satisfaction, but it does take some creativity. Sometimes it takes redefining how we think about jobs and the world of work. In summary, you are likely to spend upwards of 80,000 hours working over the course of your life and you deserve to spend that time doing something that makes you feel satisfied and happy! Of course, you may not feel that way every second of every day, but as a general trend, it is important to enjoy what you do during those 76,000+ hours. If you think you could use some guidance in finding career or job satisfaction, please feel free to give me a call to set up an appointment.